Okay, I have to admit that I like to bake. It is one of my favorite things to do when I feel moody. My family loves when I bake and, of course, they get the most benefit out of it. I made sweet buns the other day. They are not just the plain old buns, but honeycomb patterned buns with cream cheese filling inside soaked in sticky honey syrup. 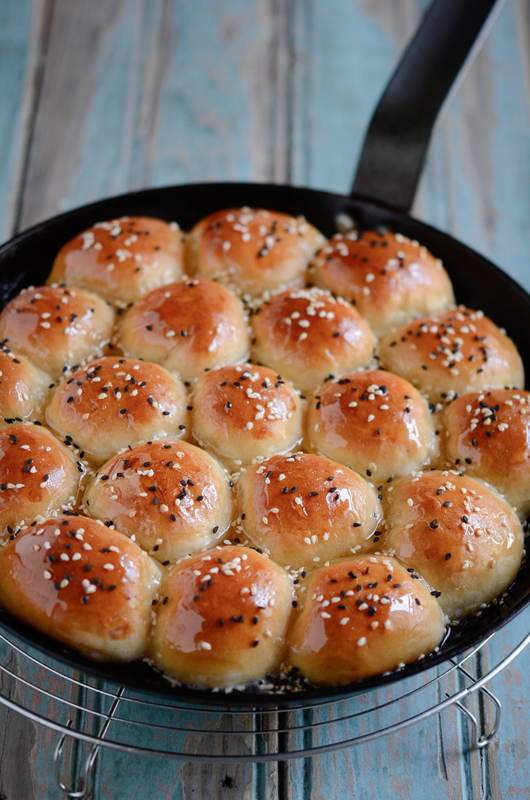 They are sweet Arabic dessert called “Beehive Sweet Buns”. The good news is that they are easy to make with the ingredients most people already have in their pantry. Nothing exotic! And the bad news…? You can’t stop eating once you put one piece in your mouth. One of the interesting ingredient on the dough recipe is the baking powder. They are yeast buns, but the addition of baking powder makes them feather light and extremely soft. The dough comes together on the sticky side, which makes them very tender. The cream cheese filling makes them even more special. You will need to make 20 pieces (although I only used 19), and it didn’t take that much time to complete. The dough is very forgiving and you don’t need to try to make them pretty. 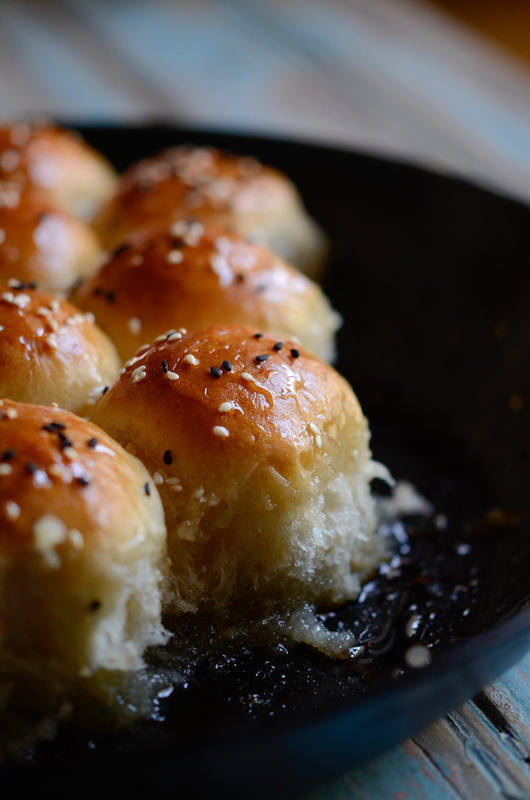 The egg yolk wash will bring an attractive golden hue to the buns. 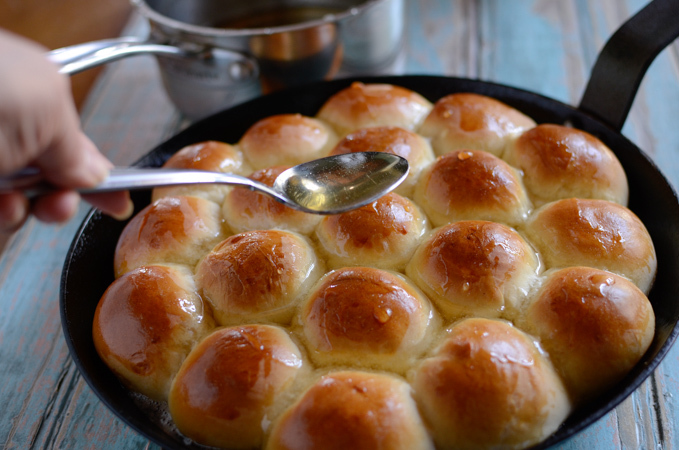 When the buns are in the oven, you can make the simple honey sugar syrup. You can add other flavors, such as vanilla, cinnamon, and etc, to the syrup mixture for variety of flavor if you want, but I kept mine plain. And when they are done? Behold, the sticky shiny glory! You will want to eat them when they are warm. Sooooo heavenly good! I honestly intended to eat only 2 buns, but it soon became 3, then quickly 4, and then I ended eating more before I knew it…!!! I don’t even remember how many I ate. I think I ate the half batch all by myself. 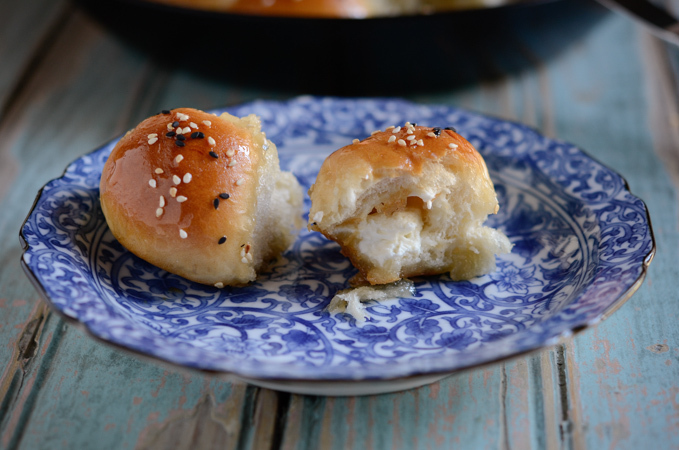 An Arabic dessert, these beehive sweet buns are filled with cream cheese and soaked in honey sugar syrup. 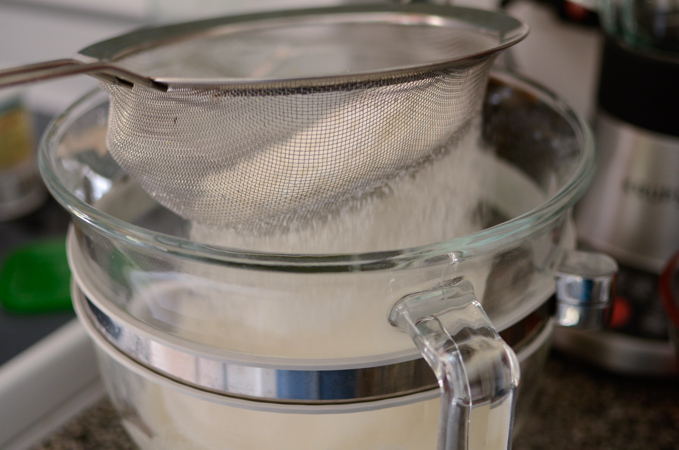 In a large mixing bowl, combine milk, oil, honey, and yeast; mix well. Sift flour, baking powder, and salt together and add to the wet ingredients. Mix with a spoon, then knead the dough for 5-8 minutes until it becomes elastic. You can add a little more flour if your dough seems too sticky. Cover the dough with a towel and let it rise for 1 hour or until it becomes double in volume. Turn the dough onto a wooden board dusted with a little amount of flour. 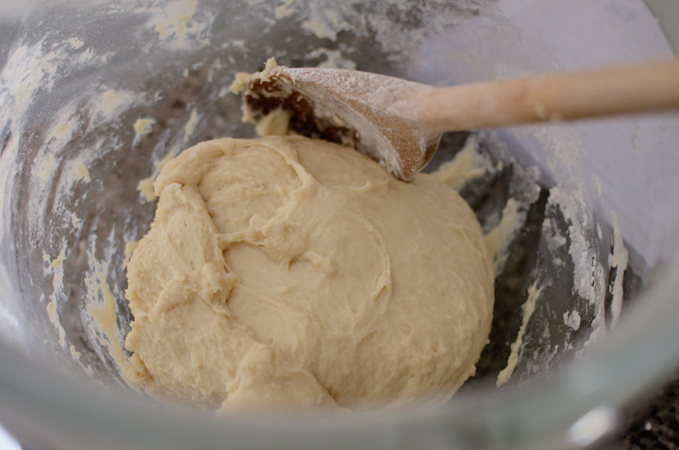 Bring the dough together and knead a few times. 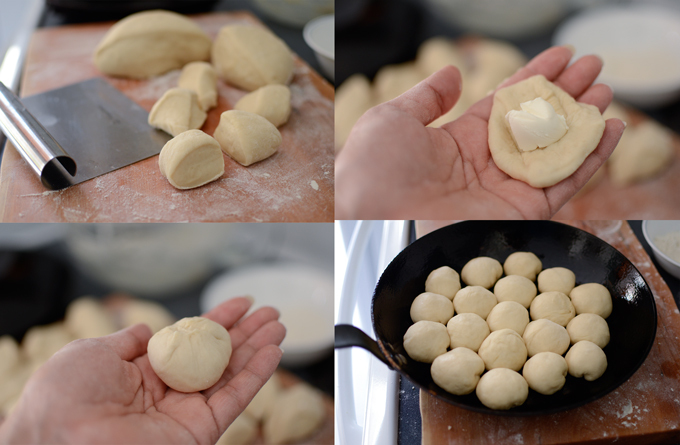 Divide the dough into 20 balls. Flatten each ball and stuff with a teaspoonful of cream cheese. Pull up the sides of the ball and wrap around the filling, pinching it closed at top. 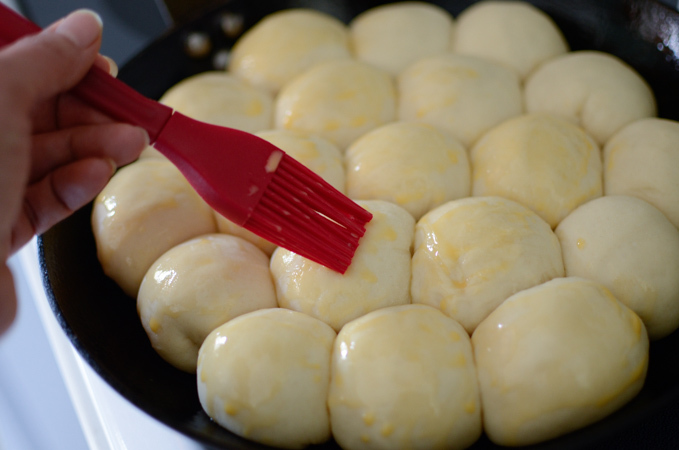 Arrange the balls in a greased 9 or 10-inch oven proof skillet or round cake pan in honeycomb pattern. Cover and let them rise again for about 40 minutes. Brush the top with egg yolk wash and bake the buns for 25 minutes. 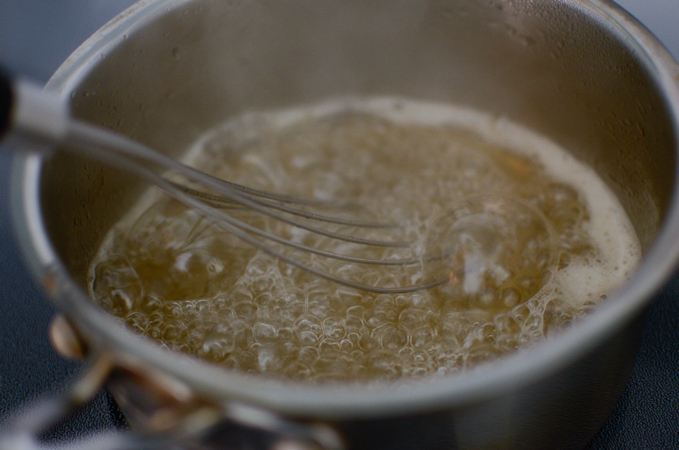 To make the syrup, combine sugar, honey, and water and bring to a boil, reduce the heat and simmer for 3-4 minutes or until the syrup starts to reduce a little bit. Set aside until needed. 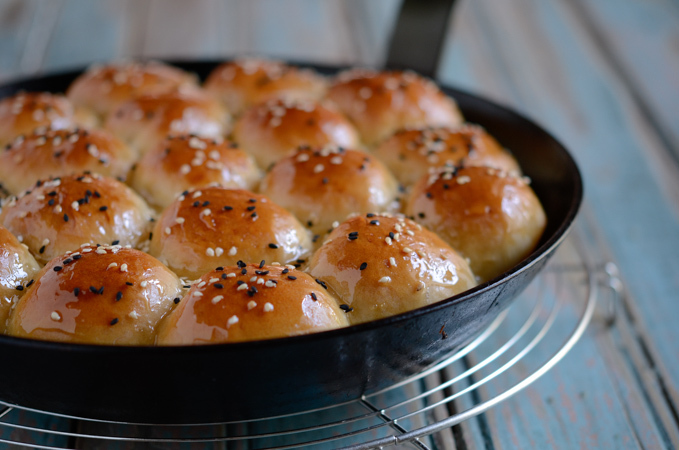 When the buns come out of the oven, pour the syrup over the hot buns, and sprinkle with toasted sesame seeds on top. Cover the buns with a piece of foil and wait for 10 minutes. Serve warm or at a room temperature. I literally just took these out of the oven and ate two with wanting more! They are so delicious. I did add a hint of orange blossom water to mine but with or without that hint its freaking good, amazing! I'm suppose to take some later to a friend but I seriously doubt any will make it!!! Thank you for this recipe! I am a picky foodie! My husband is Arabic so I love trying recipes! 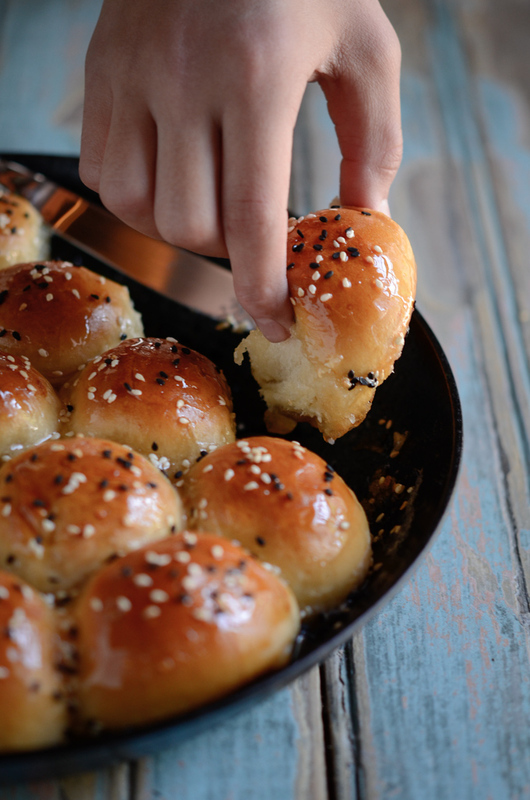 That is so great that you liked these little buns. Aren't they so tasty? Thank you so much for leaving the sweet comment. It made my day happy! I tried these once made by a friend and have been looking for the recipe ever since! Your recipe didn't disappoint! Super Yummy! Can we leave out the cream cheese?